The Add Prefix or Suffix dialog box lets you add or remove a prefix or suffix for a multi-layer selection. For tasks related to this dialog box, see— Naming Drawing Layers. In the Timeline view, select all the layers to rename or press Ctrl + A (Windows/Linux) or ⌘ + A (macOS). 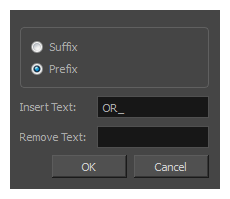 In the Scripting toolbar, click the Add Prefix or Suffix Script button. If the Scripting toolbar is not visible, you can display it by selecting Windows > Toolbars > Scripting from the top menu. If the Add Prefix or Suffix Script button is not visible in the Scripting toolbar—see Adding Scripts as Toolbar Buttons. Allows you put a defined set of characters (letters, numbers, symbols) after the pre-existing layer name. Allows you put a defined set of characters (letters, numbers, symbols) before the pre-existing layer name. Enter a set of characters to be added to the selected layers. Enter a set of characters to be removed from the selected layers.